Today sees the beginning of Neville Brody's Anti Design Festival which will include pieces from my ongoing collaboration with Mark at Dancing Eye. Entered as part of the festivals open submission programme these works should be found somewhere amongst the Front Space display in the gallery at 28 Redchurch Street in Shoreditch. The Government says if you're going to do anything – whether it's science or art – make sure you're making money from it. What we're saying is that experimentation isn't there to make money; money is there to fund experimentation. The Anti Design manifesto produced to accompany the event can be read here (with difficulty) or downloaded as a more palatable pdf. As noted in the Creative Review, the event's self-professed 'outsider' status has been met with ambivalence by many commentators, and its 'anti-commercial', 'rebel' posturing has raised eyebrows in light of its sponsorship by the National Lottery. In order to make up your own mind I recommend checking out the debate hosted on the Guardian website between Brody and Ben Evans; director of the official festival. 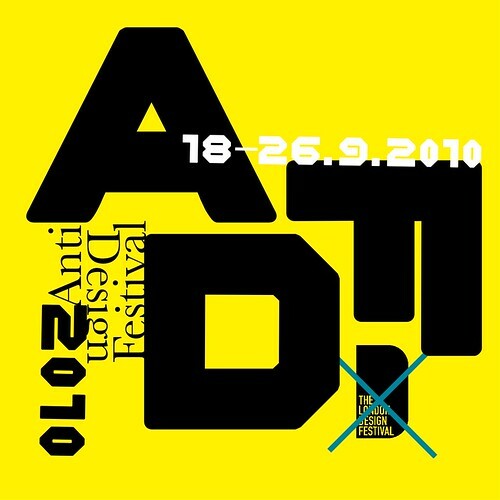 A full programme for the Anti Design Festival can be found here (pdf).